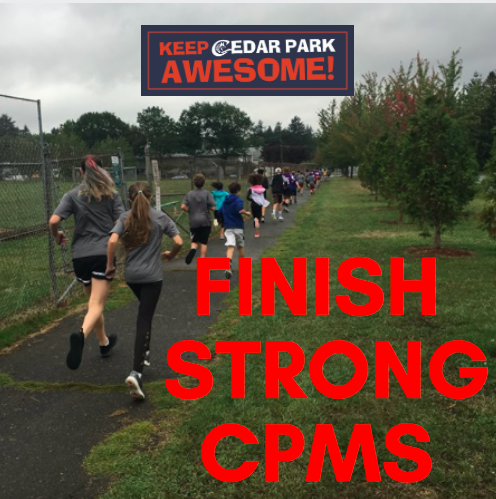 Our "Keep Cedar Park Awesome" 5K continues to gain momentum as we approach the finish line. As a community, we have achieved 90% of our goal and only need another $5000 to make all our 5K dreams come true. Students are on the verge of earning a school-wide ice cream party if the fundraising goal of $50,000 is met. Get those donations in this weekend so we can begin the celebration! You have until Thursday, 10/12, to add your contribution to this worthy, tax-deductible cause. Team and individual competitions will also close on 10/12. The top-earning team from each grade will enjoy a class party, while the school's top earner will also take home a prize. 1. Go to https://www.firstgiving.com/411287/cedar-park-5k and donate to the cause. 2. Return your cash/check to the school in the 5K envelope (or any envelope clearly marked 5K). Students can drop them off in the office.